The Cleopatra Teak Bench is a divine contribution to our huge range bench seats, adding a sense of old Hollywood glamor to our lineup of quality teak furniture! An intricate carving design marks the stunning Cleopatra Teak Bench; designed to be both a resplendent, elaborate look with a solid A-Grade Teak frame. 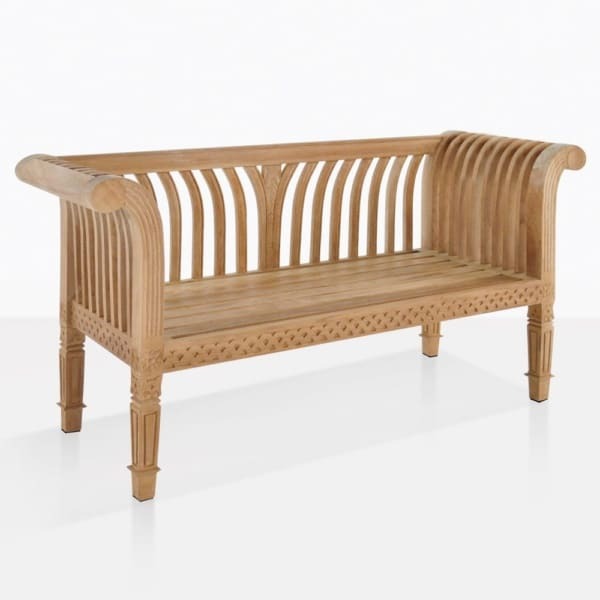 The Cleopatra Teak Bench features a stunning curved arms and flared back slats while the base and legs has an astonishing, delicate carved pattern which is unique, detailed and giving you the opportunity to host friends in complete and utter luxury. 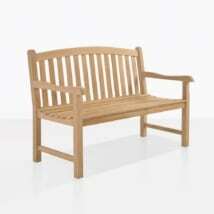 L63" x D22" x H34"
This solid A-Grade Teak Cleopatra bench comfortably seats 2-3 people. A-Grade Teak guarantees a long life, durability, easy to maintain and a beautiful product you can call your own. A-Grade Teak is our signature product at Teak Warehouse, and what brought our business to the forefront of peoples minds when they think ‘outdoor furniture.’ We offer luxury pieces for the home at a fraction of retail costs, so there is no compromising for style. The reason this particular grade of teak lasts so long is because of the age of the tree when it is cut down – at around 40 years old the tectona grandis (teak tree) is full of oil and rubber, making it stronger than any other type of wood for outdoor (and indoor) use! We have an option of every kind of furniture in A-Grade Teak! Whether you need sun loungers for your sun roof, bar furniture on the patio, deep seating nestled into your garden, dining sets lovingly placed on your deck; we have everything you require to make a gorgeous outdoor living space! And what’s more, we offer other options too! From 3 kinds of All Weather Wicker to Raw Concrete, Reclaimed Teak, Resin, Aluminium, Stainless Steel and Mesh… excited yet? We bet you are! Call us today to discuss what options might work best for your home. 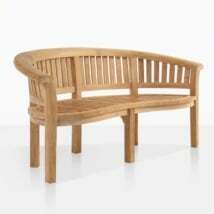 The Cleopatra Teak Bench is in a league of its own – being so detailed, our customers are thrilled to place it indoors or out. Place the Cleopatra Teak Bench in a sunny spot indoors by a window, so you may enjoy watching the world go by while relaxing in this amazing bench. Grace your outdoor patio with the fabulous Cleopatra Teak Bench, surround it with lush greenery and let this statement piece sing! 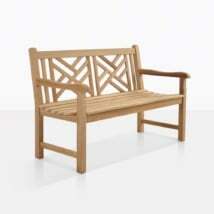 Imagine a beautiful Spanish style courtyard, fairy lights overhead, lush plants filtered between your dining tables, and in every corner a Cleopatra Teak Bench. Simply stunning. The Cleopatra Bench is our most detailed teak bench – featuring geometric and ornamental cutouts, it is available now – ready to be shipped to your home! Order yours today! At Teak Warehouse, there is no stopping quality! We check everything that leaves our warehouse, when items are delivered, it is with a white glove service, meaning that we know once it leaves our showroom, it will arrive to you as perfect as it left. 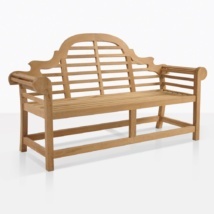 The Cleopatra Teak Bench is unique, regal, gorgeous, charming – bring a bit of this opulence to your home this summer.